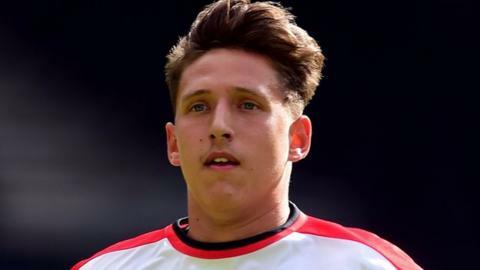 Crewe Alexandra have re-signed striker Tom Hitchcock on loan for the rest of the season from MK Dons, to cover a sudden shortage of man power up front. Having sold Ryan Colclough to Wigan in the transfer window, the Alex have now lost Southampton loan man Ryan Seager with a cruciate knee ligament injury. Added to that, they again face losing Marcus Haber on international duty. The Canadian is set to miss the Easter games with Sheffield United on 25 March and Bradford City on 28 March. Having already missed four Crewe games this season, he is now called up for the back-to-back qualifying group games for the 2018 World Cup against Mexico, in Vancouver on 25 March and in Mexico City's Aztec Stadium on 29 March. "We have looked at alternative strikers and wingers," Alex boss Steve Davis told BBC Radio Stoke. "It is extremely difficult. Not many clubs want to let players out. The better ones have already gone. But this is a player we already know about." League One strugglers Crewe stand second from bottom, five points adrift of safety, following last Saturday's first defeat in seven games at Chesterfield. Hitchcock will be expected to make an appearance in Saturday's home game against much-improved Barnsley. The son of ex-Chelsea goalkeeper Kevin Hitchcock, he has hit 15 career goals to date in 71 league appearances, over half of which have come from the bench. Three of those goals came in a five-week loan to Crewe from Queens Park Rangers in the 2013-14 season. The23-year-old followed that up by being sent back out on loan with a similarly successful stay at Rotherham United, scoring five times in 11 games to help the Millers win promotion to the Championship. Hitchcock then signed for MK Dons in the summer of 2014, since when he has had two more loan spells at Fleetwood Town and Stevenage.